I asked the LORD why He was giving me this name but He did not reveal any more to me. So, I prayed for the safety of the students and faculty and workers at “Dartmeth”. I fell back asleep and when I woke up again around six o’clock this name was the first thing that came to mind again. I wondered where it was located and immediately the thought “It’s in the Northeast” came to me. I got up and went to my computer to look up this name to verify if it was indeed a college and where it was located. Although I spelled it the way I heard it, “Dartmeth”, the first several hits were of “Dartmouth” College. I clicked on Wikipedia and realized that what I had heard was the correct pronunciation of it, and that it was indeed located in a Northeastern state. Dartmouth College, commonly referred to as Dartmouth (/ˈdɑrtməθ/ dart-məth), is a private Ivy League research university located in Hanover, New Hampshire, United States. I read all about the college and went to the college website. However, after reading all of this, I felt that I was still missing something. Then, the LORD reminded me of something that I saw but did not read. 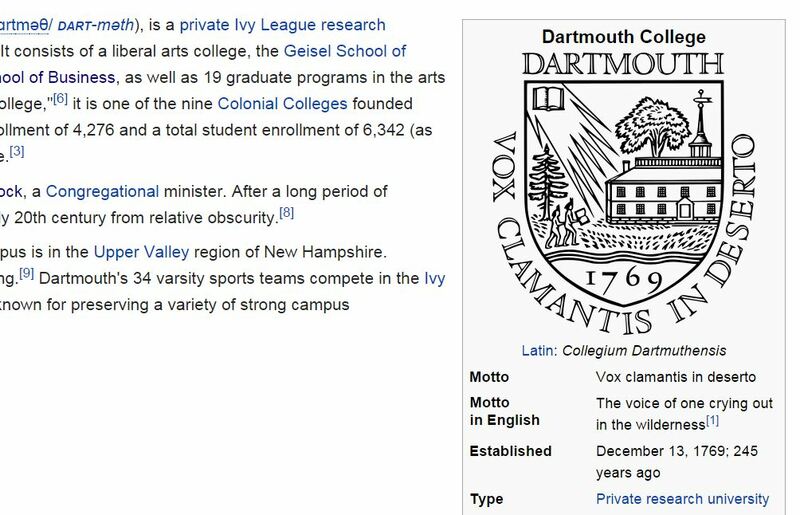 There was a header on Wikipedia that mentioned other references to the name Dartmouth. Because I had only glanced at it, I looked back at the Wikipedia page on Dartmouth College. Now I see that there is a University of Massachusetts in Dartmouth, Massachusetts and am not sure which the LORD was speaking of. I looked up this college to see where it is located. When I saw that it was located due south of Boston, I immediately thought of the Boston Marathon bombing. We just recently commemorated the first anniversary of the Boston Marathon bombing, and one of the brothers who committed this deadly attack, Dzhokhar Tsarnaev, was about to receive sentence for his multiple convictions–possibly death. This caused me to consider if other terrorists in the area might target the nearby University of Massachusetts Dartmouth as retribution because of its proximity to Boston. My eyes lowered and I found myself reading the Motto that was in Latin. I do not know Latin, but, I read each word and immediately knew I had to know what it meant. My eyes dropped to the next line and I saw that the English translation was there: “The voice of one crying out in the wilderness.” I was amazed, for this phrase is a Scriptural reference to John the Baptist, and the cry of John the Baptist to “Repent! For the kingdom of heaven is at hand” is what the LORD has had me posting on this site for years–what He has me crying out to anyone who has ears to hear. Seeing that the name the Lord spoke to me this morning, and that a college with this name’s motto is this portion of Scripture, I believe that whatever tragedy or attack that could come is more judgment on this nation because of her sin. GOD is calling to us as He cried out to Israel through His prophet, John. John was the “Prophet of the Highest” to prepare the way for Yeshua/Jesus, the Son of Yehovah/Almighty God to manifest as Israel’s Messiah, Redeemer, and as the Savior and Lord of the entire world. The LORD is still crying out through His prophets to prepare the hearts of the people to turn from their sin and to turn back to Him, for the Day of the LORD is nigh. This in itself centered my thoughts back on Dartmouth College and I wondered if it had anything to do with the University of Mass.–Dartmouth. I felt I should share what the Lord had spoken to me, but I knew there was more that He wanted me to see. After spending hours researching and seeking the Lord, a thought came to me. I wondered if Boston Marathon bomber, Dzhokhar Tsarnaev, had attended either of these colleges. I could not recall what was reported back in 2013, so I did a search. 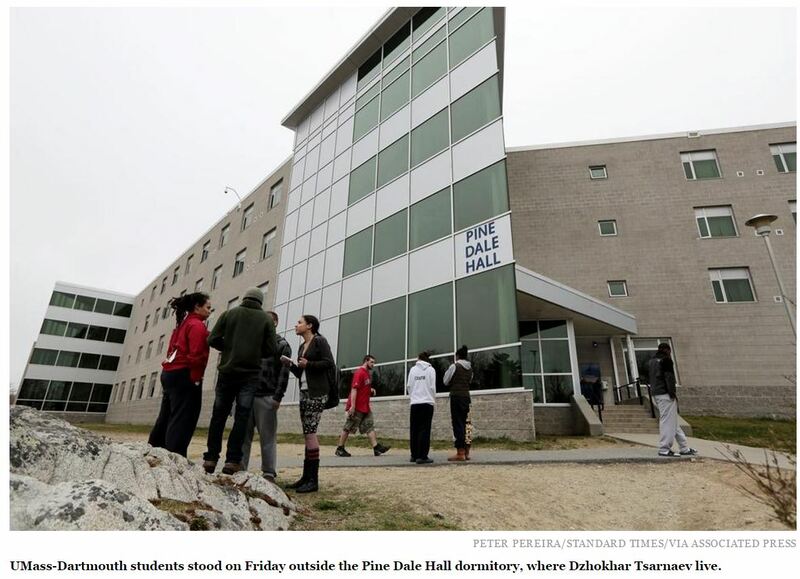 I was sickened to discover that at the time of the bombings, Dzhokhar Tsarnaev lived on campus while a student at the University of Massachusetts Dartmouth! What of me hearing the name Dartmouth given me this morning? Will something tragic happen at either of these Universities? Will terrorists retaliate after the sentencing of Dzhokhar Tsarnaev? I do not know what or when. However, I do know that what the LORD reveals to me has always proven in times past, to be a prophetic warning. Just as we see in 1 Corinthians 15:9…We know in part and we prophesy in part. All I know is what I heard from the LORD and felt led to search out. All I can do is be obedient with what He gives me and share it with you, encourage you to intercede, and admonish you to do as I feel led to do. Repent. Repent for our sins, the sins of our fathers, and the sins of this nation. Though the LORD told me years ago that what He shows me will come to pass and will not be thwarted, I still pray for His great mercy to be given in the midst of judgment. I pray for all who are at both of these colleges–the students, the staff and the faculty. I cry out for mercy from the GOD OF MERCY. He has been so very gracious to America over the centuries. He established us and we, as a nation, have turned our backs toward the One True God who has blessed us beyond measure. By the Spirit of the LORD, Isaiah continues to sing with detail of what the LORD will do to His vineyard. The song continues to explain the metaphor. As Isaiah continues singing by the Spirit of the LORD, the woe’s begin as he describes their sin and God’s righteous judgment. All through chapter five, I could see America. Isaiah’s song could be sang over our nation as well. Since 9/11 the LORD has revealed that the “hedge” that was around this vineyard called America has been torn down and unless the people of God in this nation truly repent and turn back to Yehovah/God and His Son, Jesus/Yeshua, with their whole heart, more of His righteous judgment will come upon this land.